The 9-speaker design floods your home with huge waves of epic, full-theater sound for TV, Web, Movies and Video Games. 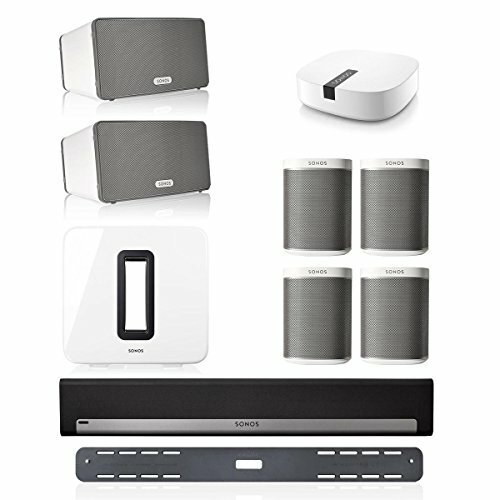 It is also a stand-alone all-in-one Sonos player that allows you to wirelessly stream all the music on earth-your music library, and thousands of Internet radio stations and podcasts. It connects to your TV using a single optical cable and power cord and plays everything that is connected to your TV. Makes Playbar easy to install to any wall. Ensures a secure and rattle-free wall-mount installation. Fills an entire room with layers of deep, bottomless sound that let you hear every chord, kick and roll. You won't just hear the difference our wireless subwoofer makes - you'll feel it. 2 force-cancelling speaker drivers positioned face-to-face means all the sound and energy from the music comes through loud and clear. Press one button, follow the simple prompts on your Controller and the system automatically adjusts audio settings to perfectly balance your SUB and the paired Sonos component for an optimized, whole-room listening experience. PLAY:1's custom-tuned drivers and software deliver rich, powerful sound, with crystal clear highs and deep, rolling lows. The sleek, versatile design easily fits where your home needs music, for surprisingly big sound. The PLAY:3 uses 3 state-of the-art digital amplifiers individually coupled with 3 speakers to deliver great sound. The wireless music system provides pure, clean sound that is perfect for bringing room filling music to a kitchen, bedroom, or just about any room in your home. BOOST is the most powerful wireless product we've ever built, and offers comparable wireless broadcast power to expensive enterprise-grade WiFi routers that are typically found in large offices and corporate campuses.